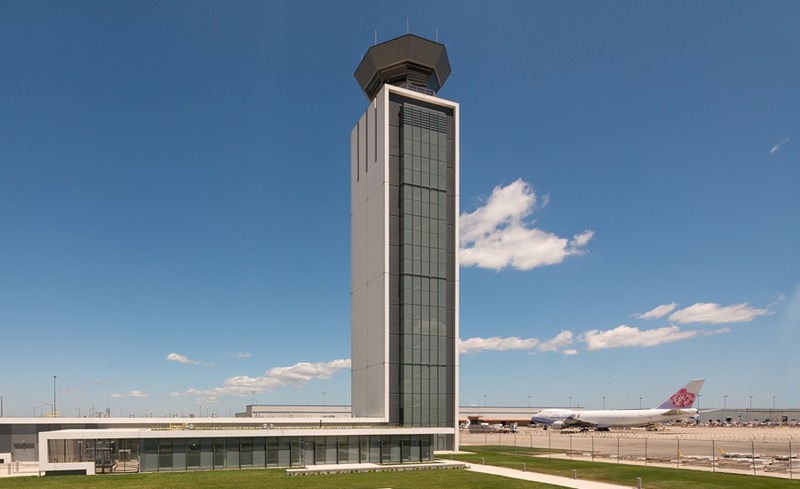 EXP is proud to announce that the Chicago O’Hare International Airport South Air Traffic Control Tower (SATCT) has achieved LEED Gold. EXP provided full architectural and engineering services from concept design through post-construction phase services for the 207-foot tall tower and 9,943 square foot base building, as well as site development and perimeter security. Our design breaks away from the “norm” to create a striking but modest shift from the traditional shaft and bulb-top design of traditional FAA Control Towers. This design evolved as the result of an intensive iterative design process with the Federal Aviation Administration (FAA) and the City of Chicago. Paramount to the success of the SATCT, was the layout of the equipment and the introduction of this solution to invert conventional tower plans by elevating “core” elements (elevator/stairs/shaft) to the perimeter, opening the center of the tower for direct access underneath the cab from the junction level rooms. The overall design provides a simple, durable and elegant facility that has the flexibility to adapt to change as new technologies emerge to meet the needs of the FAA, while also achieving the objectives of the Chicago Department of Aviation. This collaborative process, combined with a concentration on sustainable solutions, provided the opportunity for the facility to serve the well-being of the built and natural environment. Read more about how the sky’s the limit on O’Hare’s South Air Traffic Control Tower’s project page.